A few thoughts crossed my mind recently as a casual pigeon watcher. Pigeons may be the only species of bird that is so prevalent in cities. At least where I have lived I have not seen any other type of bird just walking down the sidewalk, except maybe a seagull here and there. What came to mind is that this bird has courage to want to live in the darkest, dirtiest cities in the world – concrete cities with so little green. Why if you were a bird and could live almost anywhere would you live there? Man, if I was a bird I’d be living somewhere on a sandy beach with the warm water lapping on my bird feet enjoying the day. Not hanging around with my bird feet on the sidewalk full of gum and cigarette butts outside some post office. This is a true sacrifice. This made me realize that this bird has a mission to be around humanity. 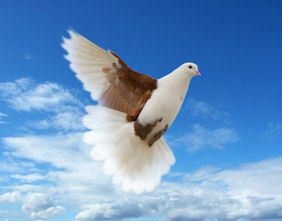 The pigeon is bringing higher frequency into dark areas of town. It has gifts for us, but we are not noticing. Pigeons mate and apparently they do not reject other birds from their flock. One day leaving for work, there was a dear gorgeous blue parakeet among a small flock of pigeons by my car. He was cruising right along as if he were a pigeon. Like dogs who show us unconditional love even if we are complete losers (in the ego sense of the word because there really are no losers), pigeons are also there to be an example of the high vibration of love.